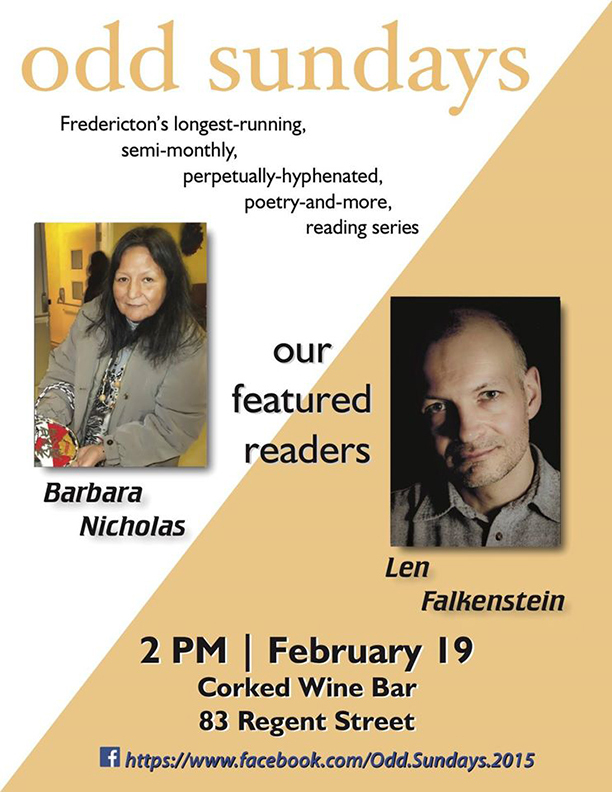 The Odd Sundays reading series invites you to Corked Wine Bar (83 Regent St.) this Sunday, February 19th at 2pm for readings from Barbara Nicholas and Len Falkenstein. When Barbara Nicholas was seven, she would tell stories to her sisters as they went to sleep. When she was 22, she was writing plays, doing choreography with the children, and making the props and costumes. She formed the Negootkoog Mat-hus Theatre in her community. Inspiration for her last play The Black Snake came to her in a dream. “I used to walk from my house to the road and every time I walked on the road I would stop by a certain fir tree and I would grab his arm and shake it and say, "Good morning how are you feeling. I know you don’t understand me but if you come and see me in my dreams we can talk.” Reading all the treaties and wondering about the history of her people led her to her new play TREAT-YE. She has always been an artist, and uses cloth, wood and words as her raw materials. Len Falkenstein is a Playwright/Director, and is Director of Drama at UNB in Fredericton. Len teaches and directs productions for Theatre UNB. He is also Artistic Director of Bard in the Barracks, Fredericton’s outdoor Shakespeare company, and NotaBle Acts Theatre Company, which stages an annual festival of new plays by New Brunswick playwrights. Len has written a number of plays that he has produced with his company Theatre Free Radical. 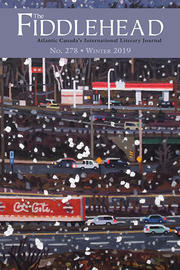 Lac/Athabasca, first staged in 2014, won second prize in the Herman Voaden National Playwrighting Contest as well as the Dorothy White Award in the Ottawa Little Theatre’s National playwriting contest. Utopia, first performed in 2012, also won the Dorothy White Award and has been staged at SummerWorks (2013) and in co-presentations with Saint John Theatre Company and NotaBle Acts. Len’s new play in development, Soft Target, will premiere in Saint John with the Saint John Theatre Company this June.